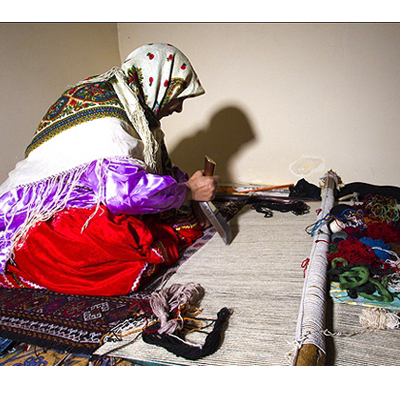 Kurdish Sofreh is a kind of rug made by women in northeast of Iran. It won UNESCO award of excellence for handicrafts in 2013. Sofreh is woven by hand. In the past it was used by nomads to wrap it around bread to keep bread safe from humidity. Today, it is used as a rug because it is expensive. Sofreh is consisted of a margin woven to the fabric by thimble. Geometric, animals and plants symbols are woven on the fabric. Sofreh is so unique because it is woven without any plan. That is why it is impossible to find two rugs with the same pattern. This kind of texture is an indication of weaver’s enthusiasm, zest and passion for nature. The old patterns on Sofreh shows culture, art, beliefs, customs and complicated history of Kurdish people in this land. The symbols on the pattern represent cultural, social and economic lifestyle of Kurdish people. Warm colors are used in the texture of sofreh which is the symbol of love, life and hope for the future. This delicate rug is usually made of camel, sheep and goat’s wool and natural and Vegetable dyes are used for coloring them. To see our kurdish Sofreh collection, please click here.